A collection of things Harris, in no particular order, but hopefully & ever so loosely in the order of the family tree. If you have Harris blood and you are looking at this page, it most likely is from this man you descend. 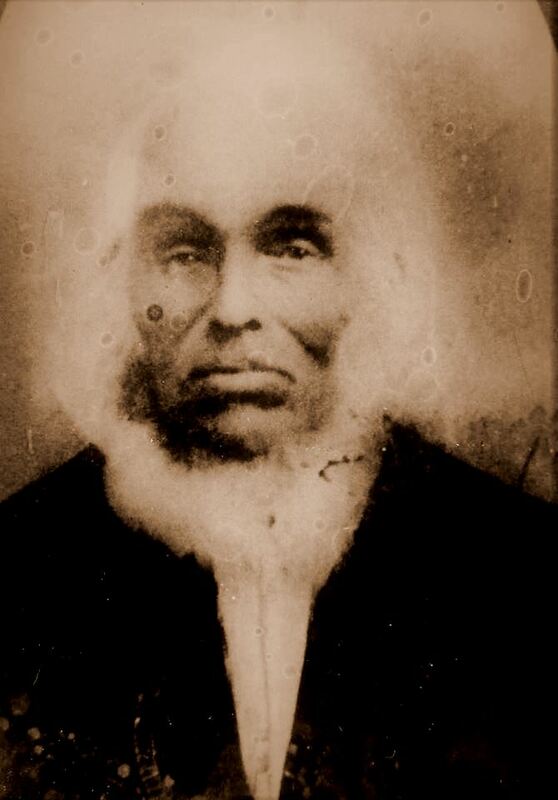 This is Jonas Hiram Harris, father of Peter Jacob Harris. He was born at Roanoke , Virginia in 1805 and died 1882 near Darlington, Missouri. He is buried in the Long Branch German Baptist Brethren cemetery. His wife was: Sarah Zerelda Wertz. His children: Julia Ann Pierce, William Wesley Harris, John Lee Harris & Peter Jacob Harris. Jeanette Hartman Gish Harris is the older lady. Veda Flyger thinks that the younger lady is probably Jeanette's daughter Nancy. 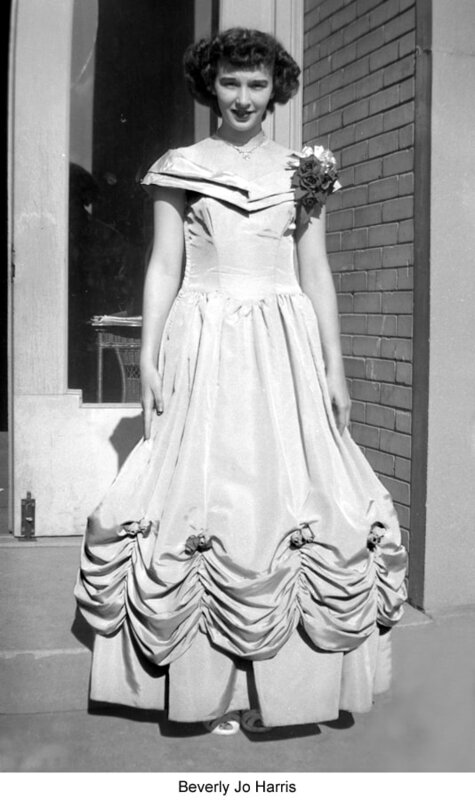 This photo was shared by descendant Betty Stevicks, Photo 3922. Betty Stevicks, another Harris descendant, has shared a number of old family pictures as well. When sharing this one, she said? The older lady is: Jeanette Hartmann Gish, wife of Abraham III Gish. Who is the younger lady? Jeanette Hartmann (21 Nov 1824-17 May 1906) was the mother of Susan Elizabeth Gish (29 May 1848-20 Jun 1920), who married Peter Jacob Harris. The other children of Jeanette and her husband Abraham were: Alice/Alsey Ann Gish (23 Jul 1850-18 Aug 1882), Mary L. Gish (7 Jan 1853-24 Aug 1853), Matilda A Gish (7 Jul 1854-), Sarah J Gish (27 Jan 1857-), Daniel N Gish (19 Jul 1859-), William Gish (2 Aug 1862-24 Mar 1863), Nancy Gish (15 Jul 1864-18 Feb 1945). Ruby Southcott posted the following information and obituary on Peter's FindaGrave.com memorial. It is helpful for sorting out their many descendants, and Susan's obituary (at right) is helpful in establishing some of the family's movements. The photo above was shared on Facebook in February 2018 by Daniel and Veda Flyger. Veda says: "I am the daughter of Maude Stevicks King. My mother was the daughter of Lee Stevicks who was the son of Charles Stevicks and Nora Harris. 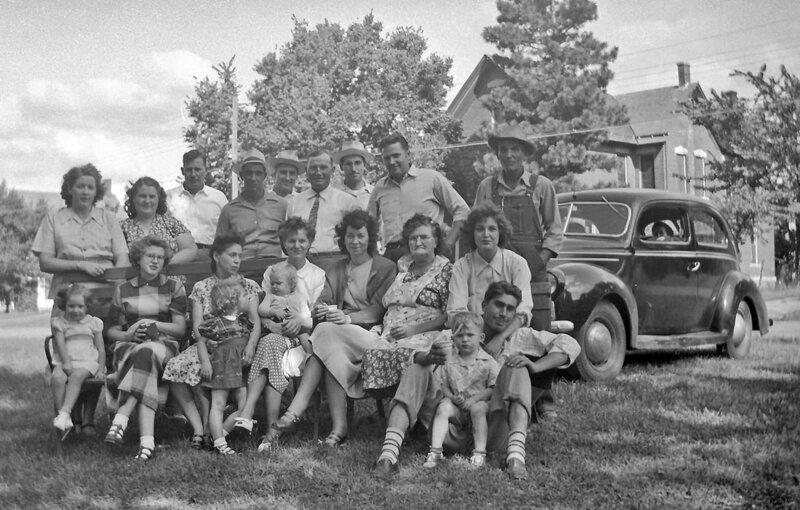 Nearly all of the Stevicks, and some of the Harrises and Carters came to Gregory County, SD. Some of them returned to Table Rock but Charles and Nora and their descendants stayed here in SD." This is the Long Branch German Baptist Brethren (Dunker) Church of Darlington, Missouiri. The fellow on the far right is Peter Jacob Harris, Grandma Nora Stevicks' father. The guy next to him with the black hat is Grandpa Charlie Stevicks. The little guy he's holding is Grandad Lee. The old man next to him with the long white beard is old Grandpa David Stevick. The woman next to him looking down is Susan his wife. The young girl kind of between and behind them is Grandpa Charlie's little sister Maggie who died young and is buried in MO. The second gal from the left is Nora Stevicks with the plain bonnet. Edd's the one that she's holding. Aunt Goldie hadn't been born yet. The second woman to her left, (to the right of her as we see the picture) , older woman, is Peter Jacob Harris's wife, Grandma Nora's mother. There are a number of the Harrises one can pick out of the picture. That's Peter J. Harris's dad's brother that appears between Grandpa David and Grandpa Charlie. You can see many of the Stevicks today get their eyes from that side of the house. ​They had just remodeled the church house in 1899 and that's why this picture was taken . I found this in the Truman Library collection. Table Rock? As to the why, one can only assume they saw it as an opportunity to better themselves. ? When the Gish, Carter, Stevicks, and Harris families left, the few families that were remaining moved to KS. They had all been early pioneers in the Gentry County, Missouri area. 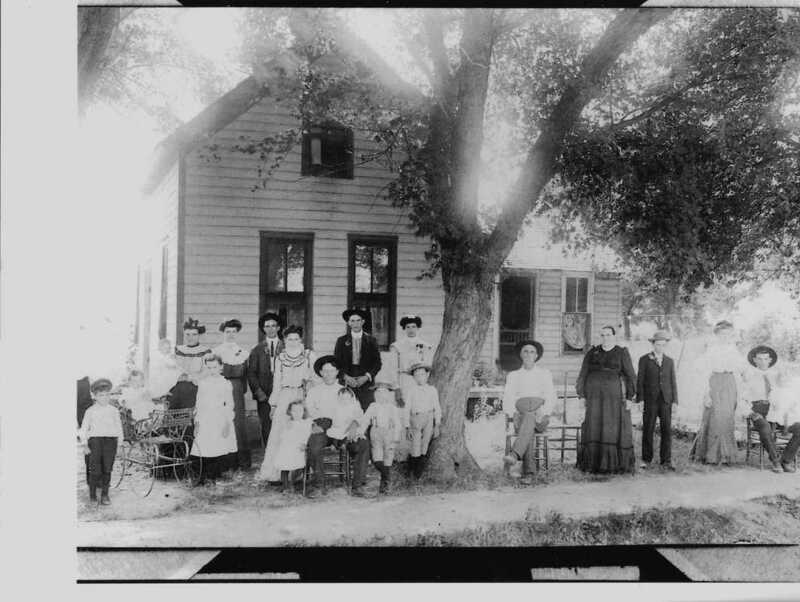 The Stevicks clan had come from IN by way of IA and the others had come from Roanoke/Wirts Virginia area. This is a photo of the family of Peter Jacob and Susan Gish Harris. It was taken in about 1904, so is likely in Table Rock. It was shared on Ancestry by jbshi19832. Photo 4090. Peter Jacob Harris was born April 21st, 1850 in Roanoake0 County, Virginia and died in Table Rock, Nebraska October 18, 1914. His parents brought him to Missouri when he was about three years old. He was married to Miss Susan E. Gish December 21, 1872 in Gentry County, Missouri where they together made their home until the spring of 1902, when they moved to Nebraska and settled at Table Rock. Of this union were born five sons and four daughters, of one each have preceded their father to the other world. The wife, four sons, three daughters, two brothers, one sister and twenty six grandchildren survive. He united with the Baptist church when about twenty three years of age and from this church he never severed his relation. During his recent sickness and last days he gave to his family and friends assurances of his faith in Christ as his Savior and of his readiness to go home. ​His funeral was conducted from the M. E. church Monday afternoon in charge of Rev. A. E. Chadwick and interment was made in the Table Rock cemetery. Frances Harris married W. G. Shepherd. They had the Hotel Murphy, next to the depot, for many years and here is a family picture taken there. Photo 3640, shared by Ted and Nancy Quackenbush. Ted and Nancy have shared many more photos of Frances and W. G.'s family, which you can find in their photo collection. The link to it is immediately above. Photo 4093, Vess Harris & Carl Roach, shared by Veda Flyger. Vess married Talitha Roach in 1904; Carl's relationship to Vess is unknown. Photo 888. The only person identified is Vess Harris, on the far left. 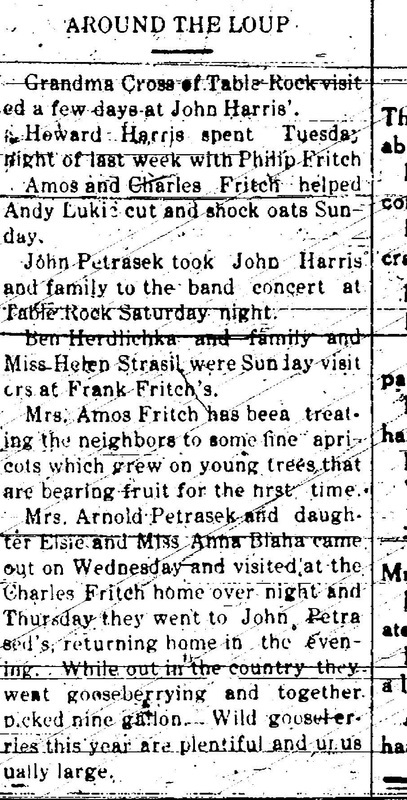 Talitha Roach Harris's obituary from the Table Rock Argus, Oct. 31, 1963. Mrs.Talitha Cuma Roach Harris daughter of the late William Roach and Mary Weddle, passed away at 3:15 Wednesday afternoon, October 24, 1963 at the Humboldt Hospital. Mrs. Harris had been in failing health for several years. 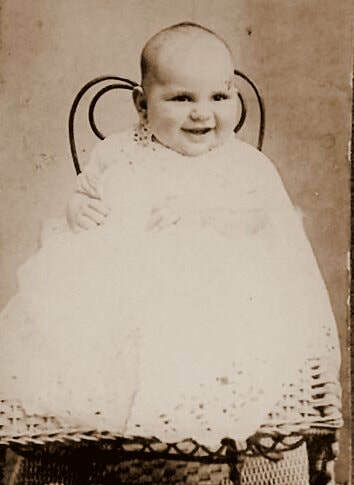 Mrs. Harris was born January 28, 1887 at Allendale, Missouri. She came to Nebraska in 1903. She was married to Vess Harris on November 6, 1904 at Pawnee City. 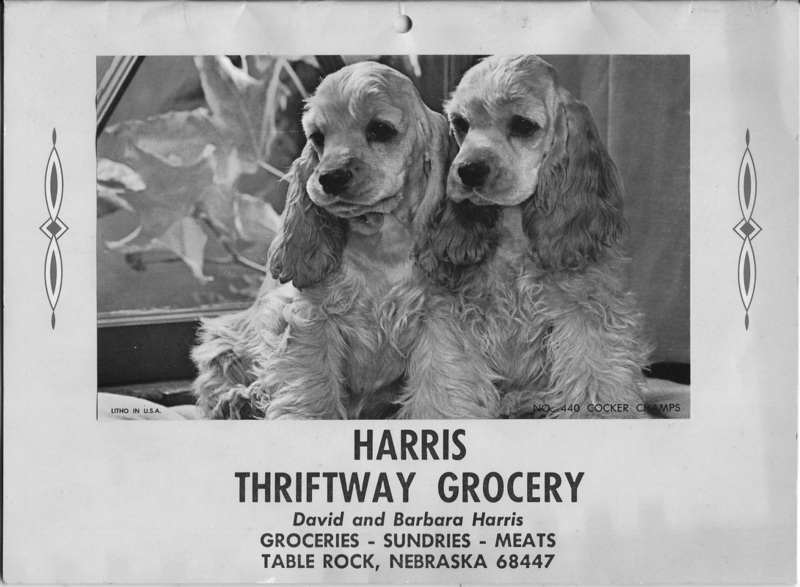 Born to this union were four children: Archie Harris of Humboldt; Raiford Harris, Lincoln; Dean Harris, Pittsburg, Calif.; and one daughter, Mrs. Faye Snook, who passed away in December of 1955. Mrs. Harris was a member of the Table Rock Methodist church. 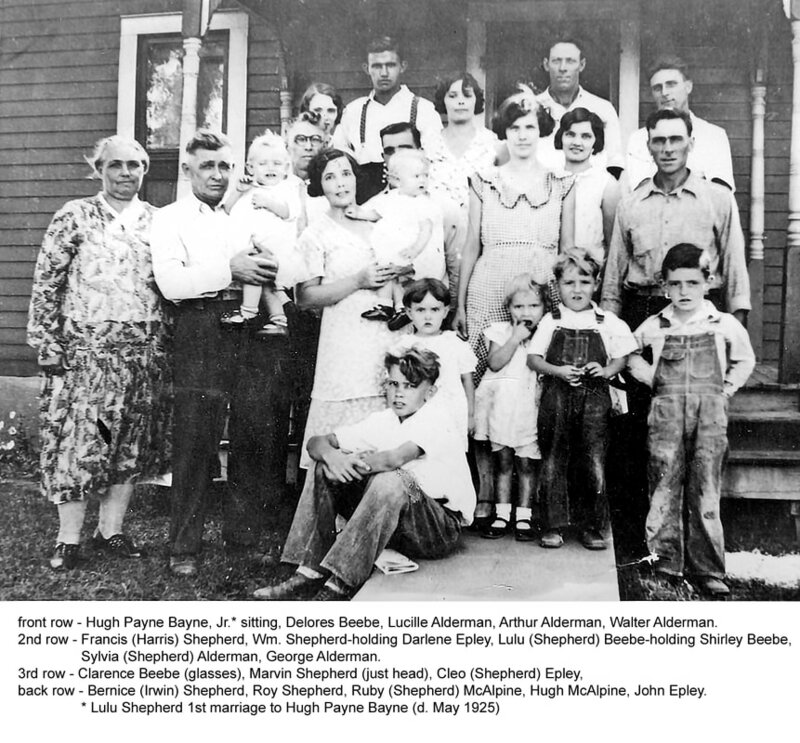 Surviving her are her husband, two sisters, Evala Roach and May Harris; six grandchildren; six great-great-granddaughters and one great-great-grandson. She was preceded in death by two sisters, Mrs. Andrew Monday, and Clarice Bindrum, and a brother, Omer Roach. Funeral services were held on Saturday morning at the Wherry Chapel in Table Rock with the Rev. Ward Merritt conducting the service. Burial was made in the Table Rock cemetery. Vess Harris's obituary from the Table Rock Argus, Feb.3,1972. Note that some of the dates do not correlate with those in Talitha's obituary. Hers says she came to Pawnee City from Missouri in 1903 and married Vess in 1904; his says he came to the area in 1901, married Talitha that year, and moved to Table Rock in 1904. Jonas Sylvester (Vess) Harris passed away on Saturday January 29, 1972, at the Pawnee County Hospital in Pawnee City, Nebraska. Mr. Harris was born on August 3, 1882 in Albany, Missouri, a son of Peter and Susan Harris. His early years were spent near Albany until 1901 when the family moved to Pawnee City, Nebraska. 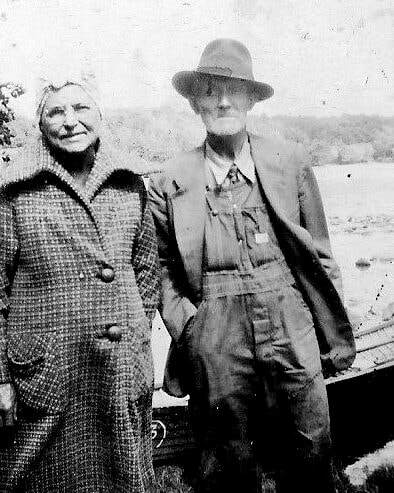 On November 9, 1901, he was united in marriage to Tablitha Cuma Roach in Missouri. They made their home in Pawnee City until 1904 when they moved to Table Rock, Nebraska. Surviving him are three sons: Archie of Humboldt, Nebr. ; Dean of Pittsburg, Calif.; and Redford of Lincoln, Nebr. ; Three brothers: Irve and Earl, both of Wymore, Nebr. and John of Pawnee City; three grandchildren and eight great=grandchildren. He was preceded in death by his wife, one daughter, and three sisters. Funeral services were held on Tuesday morning at the Wherry Chapel, conducted by the Rev. Ward Merritt. Burial was in the Table Rick cemetery. Singers at the funeral were Mrs. Jesse Nemachek,Jr. and Mrs. Joe Sochor. Mrs. Ross Thiemann was organist. Serving as pallbearers were Clifford Harris, John Harris, Marion Shepherd, Bill Stevicks, Fred Stevicks, and Myron Bright. Undated photo of Jane Harris Carter, shared by Veda Flyger. Photo 4092. That is my Great Aunt Jane! Man oh man, she could make the best milk gravy! Jane was born in Albany, Gentry County, Missouri on September 20, 1887. She married William Milton ("Bill") Carter on October 6, 1908. She and Bill had three children. A set of twins were born in 1909, Milton ("Buster") and Mildred. Mildred died in 1910 and is buried next to Jane. Another son, Donald Earl, (who went by Mike) was born in 1911. Jane died on November 5, 1969. Mildred and Milton (Buster) Carter, Jane & Bill's twins. You can see Buster in the picture below, the little boy on the right. Photo 3921. Mike McCourtney & Buster Carter, photo 557 shared by Delores McCourtney Penkava. 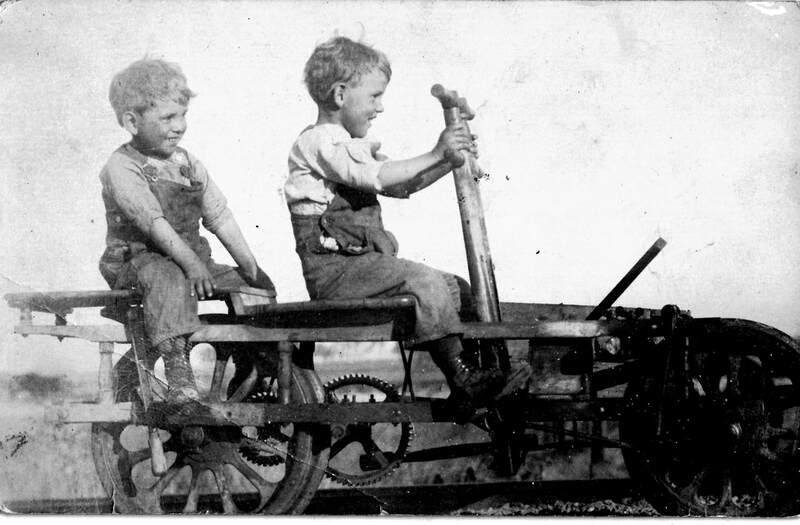 The boys are playing on a piece of railroad equipment used by rail inspectors. Jane and Bill lived near the depot. Her husband Bill reportedly worked for the railroad. Her son Milton, sometimes called Buster, worked for the railroad, too. An old railroad man on the Historical Society's website, J. Pete Hedgepath recalls that Buster worked as a brakeman on the Wymore Division line. Bob Sitzman recounted with a smile that Jane would often come out of her house -- which was close to the Wymore line -- when Buster's train left the station and wave to him and he would wave back. Baby Donald Earl (Mike) McCourtney, shared by Veda Flyger. Photo 3920. Son of the happy baby! That happy little baby at the left -- Donald Earl (Mike) Carter -- lived for many years after this picture was taken. He was born in 1911 and lived to be 77. His namesake nephew Donald W. Carter, son of Mike Carter's brother Milton, was born in 1935 and lived even longer. Here is Donald W. in 2016, to the right. He was born in 1935 and lived to be 81; he died in 2017. This is Photo 3161, shared by Donald W.'s niece Cathy Rech. 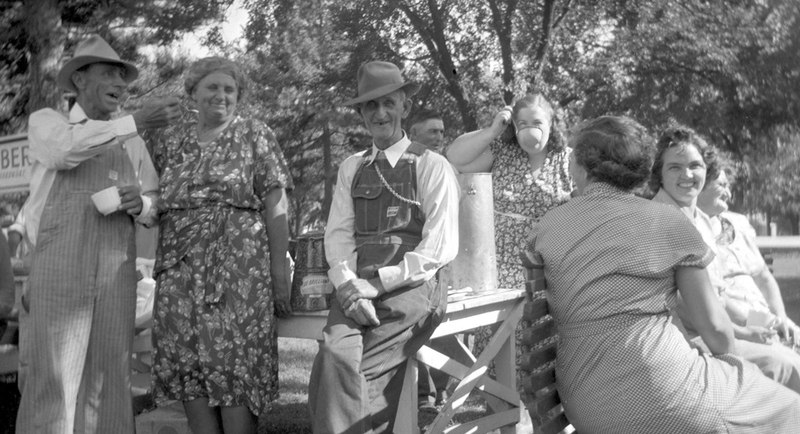 At the 1949 Harris family reunion in the Square: Jane Harris Carter with W. G. Shepherd (left) and Ernest Shepherd. W. G. was married to Jane's sister Frances (first name Julian) and Ernest was W. G.'s brother. Photo 249, shared by Ted & Nancy Quackenbush. Jane Harris married Bill Carter in 1908. 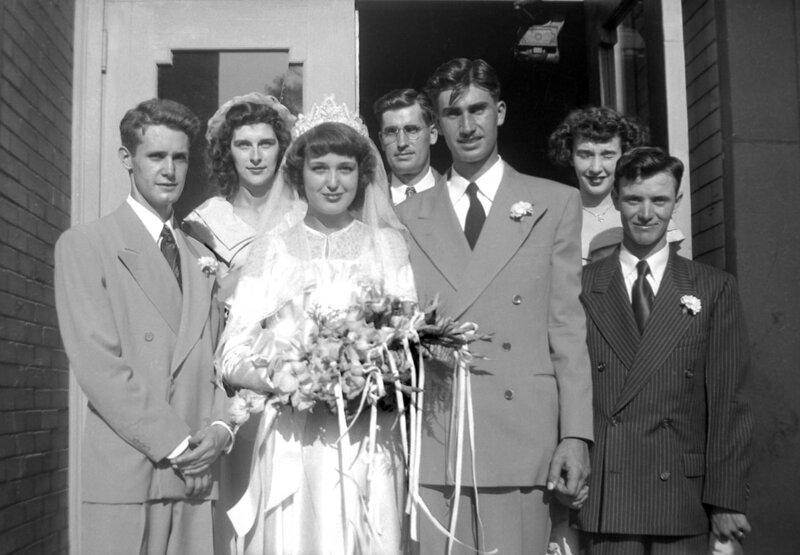 In 1955, her son Verlin married the mother of the little girl in white in the picture to the right, Cathy Rech, who shared this picture, identified for reference as Photo 3160. In the picture: Bill & Jane Carter, their grandson Billy Carter, Verlin and Betty Anderson Carter, Mabel Anderson (Betty's Mother) and, in front, the little girl is Cathy Rech. This picture was taken in the living room at Bill & Jane’s house near the depot in Table Rock on the day that Verlin & Betty were married, Nov 11, 1955. This photo of Charles and Nora was shared by Veda Flyger, their granddaughter. 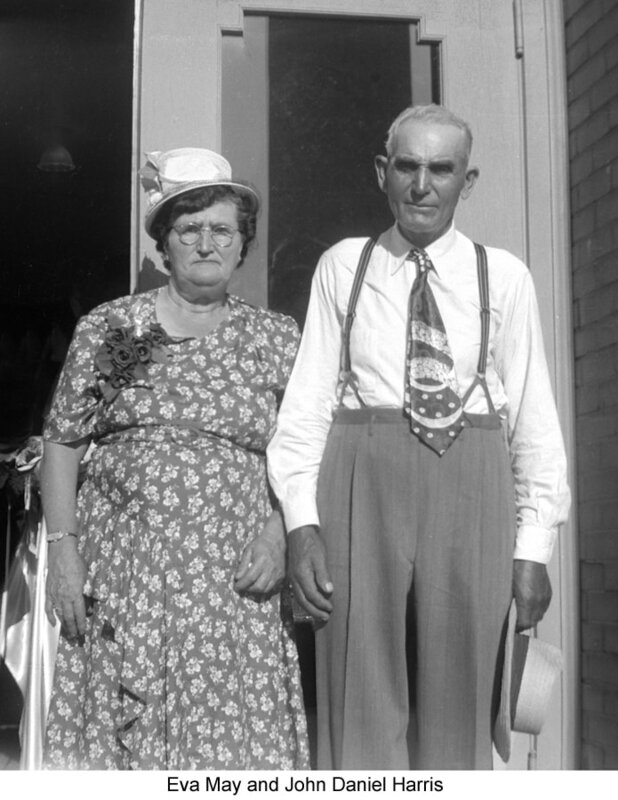 While Charles and Nora moved to South Dakota, where they lived out their lives, Veda thinks that based on their apparent ages this photo was taken while they still lived here. Photo 3214. The photo below on the left was shared by Veda Flyger, a descendant of Charles and Nora Harris Stevicks. Here are Nora (a daughter of Peter & Susan Harris) and Charles. Nora and her husband moved to South Dakota. Though some of their children returned to Nebraska, Nora and Charles they remained in Gregory County , South Dakota the rest of their lives. Photo 3209. Above is Charles Hayes Stevicks, Nora's husband. Veda Flyger shared this, commenting, "From this man descend every Stevick in the US whose name has an "S" on the end. Son of David Stevick and Susanna Jane Drake. 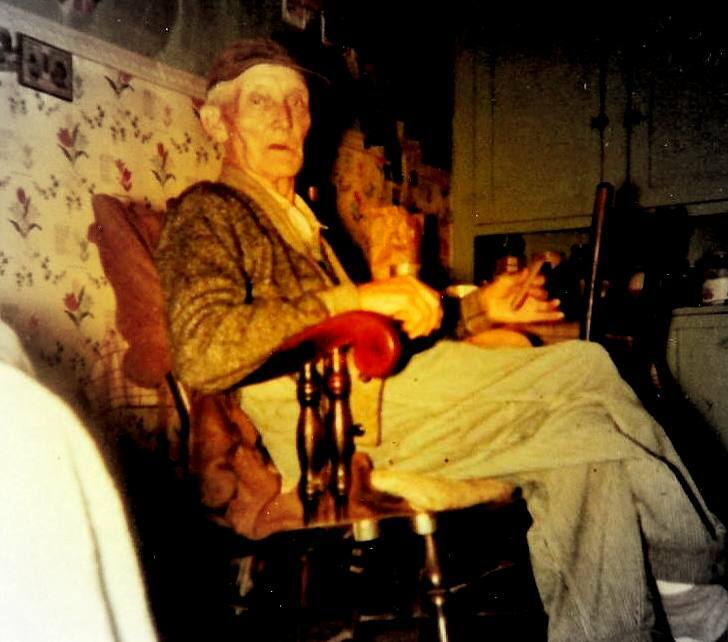 This was taken in the 60's when he was in his 90's at his house in Burke, South Dakota." Photo 3213. When Veda Flyger posted this picture on the Historical Society's Facebook page, she didn't know many people in it. She said, "Okay, some of you Harrises help us out. 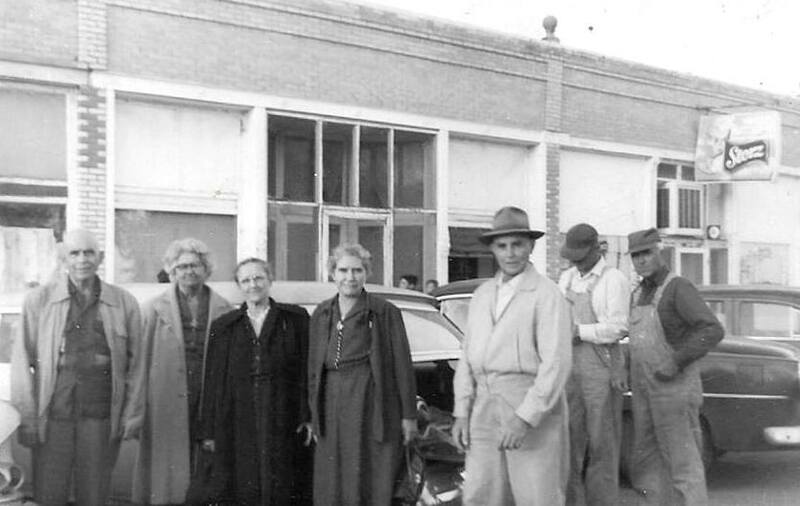 This picture was taken in Burke, SD after the funeral of Nora Harris Stevicks, Mrs. Charles H. Stevicks. 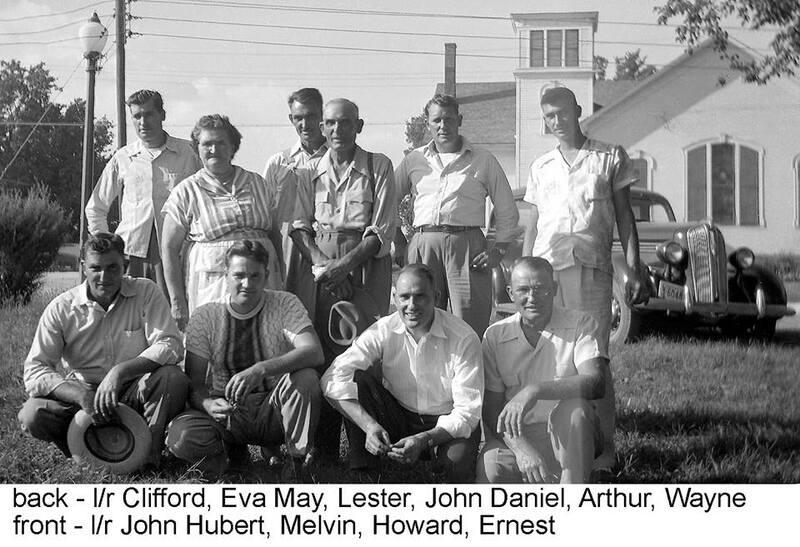 On the right is our grandfather, Lee Stevicks (Nora's son) and Uncle Melvin Stevicks (Lee's Son) The rest of the crew is from Table Rock. Tell us who's who, please." Carter descendants on the page jumped in, Cathy Rech, Dean Harris, Nancy Quackenbush, and Betty Stevicks. The aggregate memory of Veda and family is this. From the left is Vess Harris, his sister Jane Carter Harris, Vess's wife Talitha, Bernice Carter (wife of Earl Carter), Earl Carter, Lee Stevicks (Nora's son), and Melvin Stevicks (Lee's son). Descendants of John Harris who are on the Historical Society's Facebook page believe him to be the 2nd from the left. He certainly looks like the John Harris who is 2nd from the left in Photo 250 above. The one below is Photo 620. The photo is poorly labeled. It identifies 3 men without saying who is who. The names of the people in this picture are William Ellis, John Harris, and W. G. Carter. Mrs. and Mrs. John Harris: In 1956, celebrating a wedding in 1901. 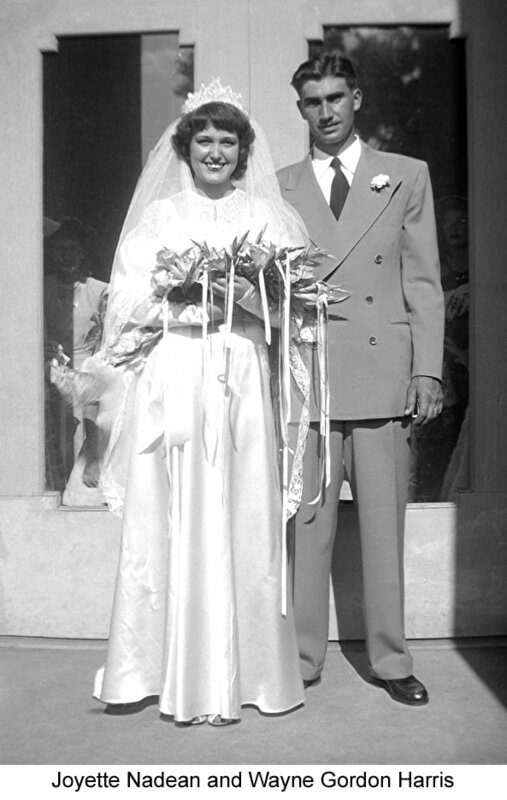 This is John and May Harris at the August 7, 1949 wedding of Wayne and Joy Harris. Photo 3655, shared by Ted and Nancy Quackenbush. Photo 3651, John and May Harris family. Nancy is my main source for getting names but she can only be sure of a few here so I won't add a name list on bottom. John is at far right and May sitting wearing apron. ​She knows Melvin is next to John. I believe Wayne is sitting at far right and if him then is by wife Joyette. At the reunions Nancy never knew many of John and May's sons as they were all much older. Also at reunions all men sat together as did all the women. Nancy thinks some of the men in photo could be John's brothers so possibly not all are sons with wives. Arthur Harris is in the picture of John Covault's Sunday school class at the Christian Church, probably the 3rd from the left in the back row. Photo 634, Harris reunion pre 1950s, George Alderman; Jane Carter; Bill Carter; drinking - Mary Harris, wife of Pete Harris (drinking); Sylvia Shepherd Alderman (back to the camera); Cleo Shepherd Epley smiling; May Harris; man over Bill's left shoulder unknown.